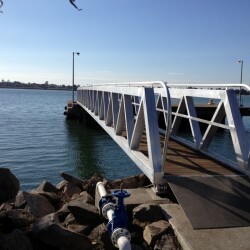 Two aluminium walkways were supplied to Dyke Point in Newcastle for Waterway Constructions. The largest walkway spanned 25 metres. These walkways were designed and detailed in-house by DWW Engineering. DWW is now Third Party certified after independent auditing by Sci-Qual to AS/NZS 4801:2001. This is a big step forward for DWW and demonstrates our continued commitment to safety. 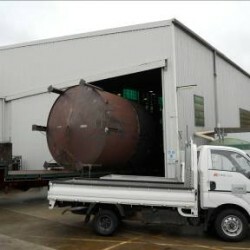 This storage tank has just been fabricated at our Darra Workshop, and is heading out for painting. Not being directly affected by the recent Queensland floods, DWW have been making their contribution to Brisbane’s repair works. We recently completed two new Aluminium Truss Gangways for Westend and Hamilton CityCat Ferry terminals. These prestigious jobs were completed on time and to our exceptionally high level of quality as we had achieved on previous gangways. The urgency of these two jobs was critical in order to help replace the flood damaged Brisbane infrastructure, and to help get the city operating normally as quickly as possible. 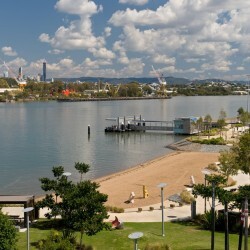 It is satisfying to see our work showcased at the forefront of Brisbane’s tourist attractions. DWW is pleased to be able to further contribute to Brisbane’s bike path network. 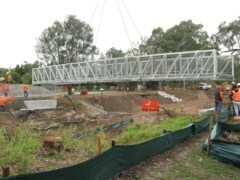 With a turnaround of 10 weeks from receipt of order to delivery, we have fabricated and delivered into position a galvanised steel bridge in Gaddes Park, Sunnybank, meeting all requirements and criteria set by Brisbane City Council. 2009 has been a year of change for DWW’s corporate image. To celebrate and maintain the growth we have enjoyed in recent years, we have this year launched new marketing tools including a brochure, stationery and our website. 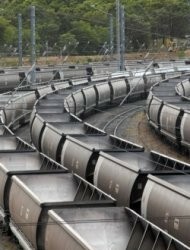 As an excellent example of the benefits our Robotic welder provides, we have recently completed another order for coal wagon discharge doors with over 1650 doors supplied to United Group Rail (North Queensland). These doors were supplied over a 12 month period according to requirements, and the use of the robotic welder ensured consistency and precision from the first to the very last door.